Water heating accounts for 15 to 25 percent of the average household’s energy bill, making it the second-largest chunk of the typical energy budget, after air conditioning. Replacing an old tank water heater with a high-efficiency tankless gas water heater (on-demand gas water heater) will save you money and reduce your home’s energy usage. Tankless gas water heaters save energy because they only heat water when you need it without storing hot water in a tank, they also heat water much faster and are capable of higher flow rates than their electric counterparts. And not only that, tankless gas water heaters provide endless hot water when sized appropriately for your home’s needs. To get the most out of your money, try to buy the best tankless gas water heater you can afford that meets your family’s needs. It may cost more initially but will save money in the long run. If you don’t know how to choose the right model, read on to find out. This comprehensive buying guide covers everything you need to know about tankless gas water heaters that will help you make the right purchase decision. If you already have an idea of what you’re after, then you can scroll straight past and read our unbiased reviews of the best tankless gas water heaters you can buy right now. How does a tankless gas water heater work? How to choose the right tankless gas water heater? After many hours of researching and reading many buyer’s reviews, plus getting advice from local plumbers, we’ve decided that the Rinnai RUC98iN Ultra Series is our pick as the best whole house tankless gas water heater. It can keep up with three showers plus a sink in the chilliest climates. And at nearly 10 GPM, it approaches the upper limits of tankless power. Its CONDENSING technology makes this unit incredibly energy efficient, as it ensures every drop of heat is squeezed out of emitted gases rather than allowing it to dissipate as vapor. Compared to a non-condensing tankless gas water heater, a condensing unit achieves greater fuel efficiency, a significant source of long-term savings. You can scroll down to the bottom to read more about the difference between a Condensing and Non-Condensing model. But for the most part, we think that a condensing unit is always a better choice when it comes to tankless gas water heaters. The fact that the Rinnai RUC98iN Ultra Series is one of the most efficient tankless gas water heater in the industry with an Energy-Factor of up to 0.96. If you don’t use too much hot water at the same time, the Takagi T-KJr2 might be the best tankless gas water heater for you. This small unit is designed for small American homes or apartments and it can supply hot water to as much as two showers operating continuously in warmer climates. In colder climates it can supply hot water to one shower and a sink. The number of showers it can handle depends on groundwater temperature. The Takagi T-KJr2 tankless gas water heater is available in 2 types: indoor and outdoor. You can choose the model that meets your requirement. It also offers safety features that keep water temperature within safe levels, like anti-freeze protection and a hi-limit switch, which turns off the unit if a malfunction leads to overly hot water. Together these prevent sudden temperature changes common in other tankless gas water heaters. Additionally, the indoor model T-KJr2-IN can be converted into a direct-vent unit by using the optional TV10 conversion kit for installation in a garage, a utility closet or any confined space in which makeup air may be limited. On top of all this, Takagi T-KJr2’s price is quite reasonable, while it offers a warranty of up to 15 YEARS for the heat exchanger and 5 years limited warranty on other parts. So if you’re looking to buy a small tankless gas water heater, we’d highly recommend this model. Those are two of the best tankless gas water heaters available that we think you should buy. Below you’ll find basic information about tankless gas water heaters, how they work, the differences between them and other types of water heaters, and what criteria need to be considered when selecting. Tankless gas water heaters, also known as on-demand gas water heaters, heat the water directly without the use of a storage tank. Instead, they are equipped with gas burners powerful enough to heat water almost instantaneously as it flows through the unit. As a result, tankless gas water heaters deliver a constant supply of hot water. You don’t need to wait for a storage tank to fill up with enough hot water. To provide hot water efficiently, many tankless gas water heaters today use various design enhancements that regulate temperature and water flow to help save money on monthly hot water bills. A tankless gas water heater has a flow sensing device that is activated when a hot water tap is opened and the necessary flow rate to activate the unit is achieved. Once activated, the cold water flowing through the appliance is heated to deliver a constant supply of hot water. The heating element in a tankless gas water heater is a gas-fired burner using natural gas or propane. When the hot water tap is closed, the tankless gas water heater senses that the flow of the water has stopped and it shuts down the gas burner. To reduce energy usage, the best tankless gas water heaters now incorporate electronic ignition of the gas-fired burner to eliminate standby losses from the pilot. The gas burners in early tankless water heaters had only two settings — on and off — so the temperature of the output water varied with the flow. Most of today’s best tankless gas water heaters, by contrast, are modulating: If the flow increases, the gas burner puts out more heat. Water comes out at a consistent temperature that can be set on the machine or with a remote wall-mounted controller. The heat exchanger is the heart of the tankless gas water heater. It has now to be of higher quality and non-corrosive material to withstand the corrosiveness, usually made of Solid Copper. Some high-efficient condensing models, such as the Rinnai RUC98iN Ultra Series or Rheem RTGH-95DVLN, have two heat exchangers: a primary heat exchanger and a secondary condensing heat exchanger, in which the secondary heat exchanger is made from stainless-steel to be highly resistant to the acidity of combustion exhaust gases. Only Navien’s condensing tankless gas water heaters use stainless steel for both heat exchangers, not just second exchangers. This ensures the best corrosion resistance. That’s one of the reasons Navien is comfortable offering an industry-best 15-year warranty on the heat exchanger, a length matched by Takagi. There are two primary types of gas water heaters: Storage and Tankless. In this section, we’ll try to explain the differences between these two types. Providing a summary of the advantages and disadvantages of tankless gas water heaters relative to conventional gas tank water heaters. These are important basic information you should know in order to choose the best tankless gas water heater for your home. Tank gas water heaters – A tank gas water heater is built around a tank containing 40 to 100 gallons of water. The most common size is 50 gallons. When someone turns on the hot water in your home, the heated water from the storage tank is delivered to the faucet, shower, etc. The tank is then refilled, and the water reheated. Tankless gas water heaters – A tankless gas water heater is smaller as it has no tank and doesn’t store any water. Since the water is heated when it’s needed, you never have to worry about running out of hot water or waiting for the tank to recover. The U.S. Department of Energy (DOE) estimates that gas tank water heaters are among the highest energy-consuming appliances in the home, accounts for about 14 percent of an average household’s annual energy expenditures, second only to the energy consumed by the home’s heating and cooling system. Because tankless gas water heaters only activate when hot water is being used, no standby energy losses are incurred, they use much less energy than tank units, therefore cutting water heating costs. Some of the best tankless gas water heaters can save you up to 40 percent of your current water heating bill. Water-heater efficiency is rated by energy factor or EF. This number is calculated by dividing the energy delivered as hot water by the amount of energy consumed to produce the hot water. If no energy was lost and it all came out as hot water, the heater would have an EF of 1. Most gas tank water heaters have an EF of around 0.61. Mid-efficiency tankless gas water heaters, such as the Takagi T-KJr2 Gas Tankless Water Heater, are typically rated between 0.81 and 0.85. These models can save about 25% on natural gas costs for water heating compared to a conventional tank water heater. For example, the average American household spends about $160 per year on gas for water heating, and could expect to save about $40 per year (at $0.80 per therm). High-efficiency units, such as the Rheem RTGH-95DVLN Indoor Tankless Water Heater, are typically rated between 0.93 and 0.98, making them on average about 40 to 50 percent more efficient than conventional tank models. Tankless gas water heaters are more expensive than their tank counterparts. The average residential model usually costs anywhere from $700 to $1,500. Installation is also more expensive because it is complex. Many tankless gas water heaters require stainless steel vent pipes that are 3 inches to 4 inches in diameter. In addition, the required gas line size is usually larger for a tankless water heater because of the higher BTU input capacities. Having to replace natural gas line adds cost, but installing a new tankless gas water heater in new construction is similar to installing a storage tank water heater. Budget about $500 for that work, which brings the total cost to about $1,200 to $2,000. The installation cost could be cheaper if you use Amazon’s Water Heater Installation Service. Most conventional gas tank water heaters cost $300 to $600 – less than half the cost of tankless varieties. Installation is also cheaper, usually about $300 to $400, bringing the total cost in the range of $600 to $1,000. However, heat pump tank water heaters can be pricey, running up to $1,500. Purchasing a tankless gas water heater will cost you more than a conventional storage water heater, but tankless gas water heaters will typically last longer. Most tankless water heaters have a life expectancy of more than 20 years. They also have easily replaceable parts that extend their life by many more years. Some of the best tankless gas water heaters from top water heater brands such as Noritz, Navien, Rheem, or Rinnai can easily last 25 to 30 years. In contrast, storage water heaters last 10–15 years. What happens when they fail? When a tankless gas water heater fails, there is no damage to surroundings because no water is stored in the unit. When a storage tank water heater fails, in most cases, the tank bursts dumping 30 to 80 gallons of rusty water on the floor, causing a major mess and sometimes damaging its surroundings. Gas Tankless Water Heaters VS. Electric Tankless Water Heaters ? Before arriving at our top picks for the best tankless gas water heaters, let’s take a look at some basic differences between gas-fired and electric tankless water heaters. In electric tankless water heaters, the heating elements convert electrical energy into heat, and the elements are usually placed in direct contact with the water so that heat is directly transferred into the flow. The electric elements heat up when the flow of water begins and turn off when the water flow stops. In gas tankless water heaters, the heating elements are in the form of heat exchangers that transfer heat from the hot combustion gases to the water. Because of the combustion process, a gas tankless water heater requires access to combustion air, and an exhaust vent is required for expelling the flue gases. Gas units use either a pilot light or electronic ignition as their ignition source. Like electric units, the start of water flow initiates the flow of gas into the combustion chamber, where it’s ignited by the ignition source. Electric units are by nature less robust than gas. Most electric units have a maximum rated flow rate of under 4 GPM, which produce enough hot water for a small-sized home in most climates. If the household is a large family that could use a large amount of hot water at the same time, then it is easy to see that a single electric tankless water heater could not adequately meet the family’s demand in a whole-house installation. A single tankless gas water heater may be better able to satisfy a small family’s hot water demand in a whole-house installation since these units are typically rated between 5-10 GPM in residential applications. The 5–7 GPM range can adequately supply a family of three or four, for a family of 5 or more the best tankless gas water heaters should be in the 7.5-10 GPM range. If you want to provide enough hot water to some showers and same appliances at the same time, always look for models with GPM reaching to 9 or beyond. While gas tankless water heaters are certainly more efficient than their tank cousins, their efficiency usually in the 80-85% range. Conversely, most electric tankless water heaters are 98-99% efficient. Some of today’s gas units feature the condensing technology that makes them significantly more energy-efficient. In terms of operating cost, as a rule of thumb, gas and electric tankless water heaters will cost approximately the same to operate, especially when you factor in the recommended annual maintenance that gas appliances require. This will depend greatly on the differential between natural gas or propane and electricity costs in your area. There are many regions where gas costs are extremely high due to the lack of supply in the region. In these areas, an electric unit can be significantly cheaper to operate. Since tankless gas water heaters are much more powerful than their electric counterparts, they cost significantly more. Most of the best tankless gas water heaters cost more than $1200, while most whole-house electric units cost $500-700. However, electric tankless water heaters are very high power appliances. Because they heat water entirely on demand, their peak electricity needs are substantial even though their total energy consumption is much lower than traditional tank-type water heaters. Consequently, it is often required that a home have a 200 AMP, 208 to 240-volt electrical service to run an electric tankless water heater (smaller whole-house models suitable for warmer climate areas can often be installed on 100, 125, or 150 AMP electrical services). Some homes or businesses do not have such electrical power available and upgrades can sometimes be expensive. No conclusion has been made about whether gas units last longer than electric units. But as you can see, most tankless gas water heaters come with a longer warranty than tankless electric water heaters. For example, the Stiebel Eltron Tempra Plus 29 Tankless Electric Water Heater and the Rinnai RUC98iN Ultra Series are two of the most popular on-demand water heaters on the market today, and both are top-of-the-line products. The Rinnai offers a 12-year warranty on heat exchanger and 5-year on parts, while the Stiebel Eltron offers a 7-year warranty on heating elements and 3-year on parts. After many hours of researching and reading many buyer’s reviews, plus getting advice from local plumbers, we’ve decided that the Rinnai RUC98iN Ultra Series is our pick as the best tankless gas water heater for larger homes. It can keep up with three showers plus a sink in the chilliest climates. At nearly 10 GPM, it approaches the upper limits of tankless power. Even more impressively, it generates that hot water with maximum efficiency, boasting one of the highest Energy Factors of all gas models. A large part of its efficiency is due to condensing technology which prevents hot gas from escaping, reusing it to heat more water instead. This feature does cost more upfront, but if your household size demands a high flow rate, condensing ensures that every drop of energy is going toward hot water. The more efficient your water heater, the lower your gas bill. The Rinnai RUC98iN Ultra Series is an indoor gas tankless water heater and it meets Energy Star standard. Its minimum-to-maximum gas burn rate varies from 15,200 to 199,000 Btu, a very wide range. In addition, the heater’s hot water flow rate range is also very wide at 0.26 to 9.8 GPM. Its minimum activation flow rate is only 0.4 GPM. These figures indicate that this Rinnai tankless gas water heater can power multiple faucets and showerheads and can be used in multi-bathroom households without interruption to hot water flow. This natural gas tankless water heater also complies with nitrogen oxide emission standards. It has bigger gas and water supply inlets and outlets than most gas tankless water heaters. It uses an electric ignition system and draws only 2 watts in standby mode. However, while it is actively working, the Rinnai RUC98iN consumes 64 watts of electric power, and it requires up to 146 watts to keep its parts from freezing during winter. Furthermore, the Rinnai RUC98iN Ultra Series offers the Most Flexible Venting in the industry. The machine can go in an old condensing vent system for replacement if needed, but new installs can use smaller, lighter, less expensive concentric venting. 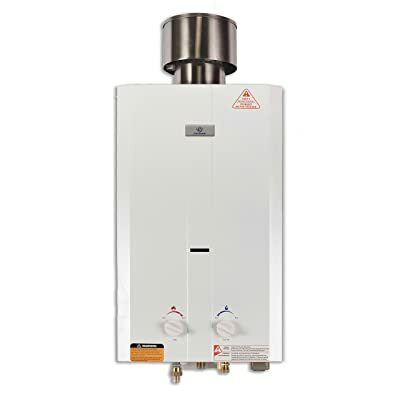 This water heater also features Rinnai Circ-Logic recirculation technology which offers homeowners enhanced convenience and energy efficiency in home hot water recirculation systems with a dedicated return line. Rinnai Circ-Logic technology, coupled with the Grundfos Pump and Timer Kit, offers homeowners the comfort and convenience of instant hot water with optimal energy usage. The combination of the Circ-Logic technology and the kit’s timer function allows homeowners to set recirculation patterns that coincide with household usage patterns. Hot water is available when needed, without the expense of circulating hot water during times of inactivity. You can see the following image to get a better understanding of how this technology works, but after all, we think the Rinnai RUC98iN Ultra Series is one of the best, if not the best, tankless gas water heaters you can buy at this time. 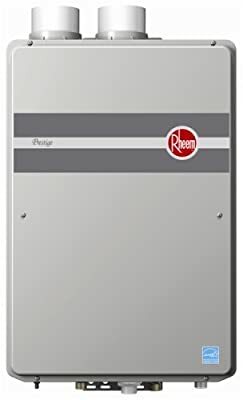 The Rheem Prestige RTGH-95 is a series of high efficiency condensing tankless gas water heaters – which is designed to offer maximum efficiency during high demand time periods in the average North American home. This unit is available in both natural gas and propane, and for both indoor and outdoor installation. With an energy factor of up to 0.94, this is one of the most energy-efficient tankless gas water heaters on the market and it’s also Low NOx compliant and ENERGY STAR rated. The Rheem Low NOx line is the most comprehensive lineup of green water-heating solutions available today. The gas burners are designed to maximize performance while minimizing NOx emissions. Constructed of 100% high-grade stainless steel, the condensing gas burner is virtually impervious to scale and mineral buildup for the life of the water heater. Its breakthrough side port design promotes even flame distribution and optimum heat transfer. This is probably why the Rheem Prestige RTGH-95 has a warranty of up to 12 years for the heat exchangers. 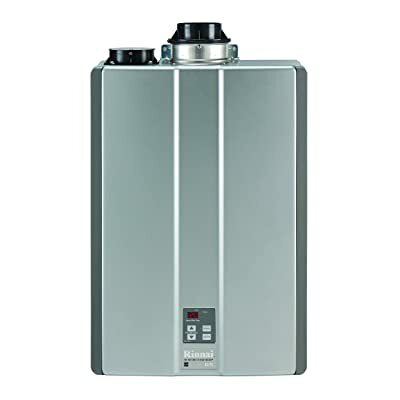 As one of the best tankless gas water heaters for large-sized homes, the Rheem Prestige RTGH-95 is designed to supply continuous hot water for up to 3 bathrooms in colder climates or 4 bathrooms in warmer climates. It exceeds the requirements for many utility rebate programs. It comes with a remote digital thermostat that can be installed in almost any convenient area of the house. Exclusively, the Water Savings Setting can save homeowners up to 1,100 gallons of water per year by decreasing the flow of water through the pipes until the temperature reaches the heater’s set temperature. The Rheem Prestige RTGH-95 is compatible with EcoNet Smart Home Technology. EcoNet-compatible appliances can be remotely managed via the app, meaning that you can turn off your water heater even when you’re far from home. While vacationing in tropical waters, a few phone taps ensure your water heater isn’t producing any of its own. 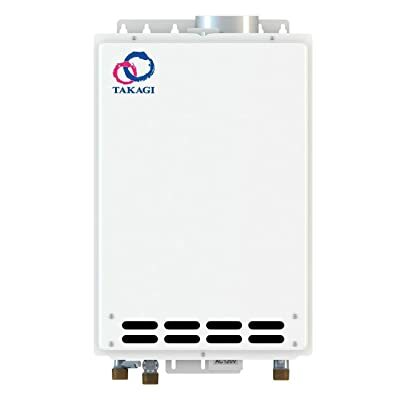 The Takagi T-H3-DV is the last model in our picks for the best tankless gas water heater for large-sized homes and this unit is also the model that has the highest GPM. The machine boasts a powerful flow rate (10 GPM), and as the Rheem RTGH-95, it’s available in both natural gas and propane. We like this tankless gas water heater because it comes with a warranty of up to 15 years for the heat exchangers residential use – one of the longest warranties in the industry. More than 3 years compared to what you get from the two models above while the price was less. When we calculated price per GPM, we found that the T-H3-DV offers the most hot water bang-for-your-buck, around $30-50 less per GPM than its peers. The Takagi T-H3-DV’s lower price is in part due to having a lower Energy Factor than some of its peers. But at 0.93, it’s still a high-efficient tankless gas water heater. This water heater is Low NOx compliant and is Energy Star qualified. Utilizing commercial-grade copper alloy for the primary heat exchanger, 316L Stainless Steel for the secondary condensing heat exchanger, the T-H3 is suitable for heavier residential usages such as space heating or domestic recirculation systems. It’s also well suited for commercial applications such as small restaurants and beauty salons. The Takagi T-H3-DV tankless water heater was very impressed us. It offers a lot of power, a very long warranty, plus nice-to-have features, at a reasonable price. This is definitely one of the best tankless gas water heaters for the money you can buy. Up to 20 Takagi T-H3-DV models can be linked together to achieve higher flow rates than with single units. The Takagi T-KJr2 Series is great for a small American home or apartments. It can produce enough hot water for one bathroom in cold climates or two bathrooms in warmer climates. 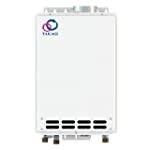 This model is the smallest unit in the Takagi tankless line. Designed to virtually do anything a 40-gallon tank-type water heater can do and more, the compact, wall mounted T-KJr2 can support hydronic baseboard or radiant floor heating applications, as well as provide domestic hot water to plumbing fixtures and appliances. 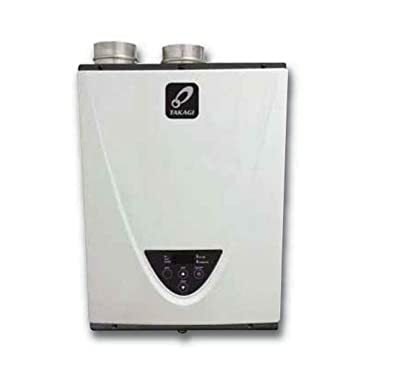 This tankless gas water heater supplies hot water at flow rates ranging from 0.75 to 6.6 gallons per minute, a rate that is typically ideal for light residential applications with one or two bathrooms, such as a small home, apartment, condo or cabin. With its compact dimensions of only 20.5″ x 13.8″ x 6.7″, this unit can be installed nearly anywhere, often allowing for installation far closer to the main point of use than traditional tank-type heaters, which reduces travel-time through pipes and wastes less energy. The Takagi T-KJr2 Series is available for indoor and outdoor installation, in both natural gas and propane. We found that the Takagi T-KJr2-IN-LP model is one of the best propane tankless water heaters for use in RVs or travel trailers. It has a perfect size for 2 people, it’s also lightweight, small, and extremely low emission. Even though Takagi T-KJr2’s Energy Factor is only 0.83 whether you use it with natural gas or propane, it seems to be a very efficient unit. Overall, if you have a very small family, look no further than this one. This is one of the best tankless gas water heaters you can buy. Takagi covers this model with a 15-year limited heat exchanger, 5 yrs limited parts. 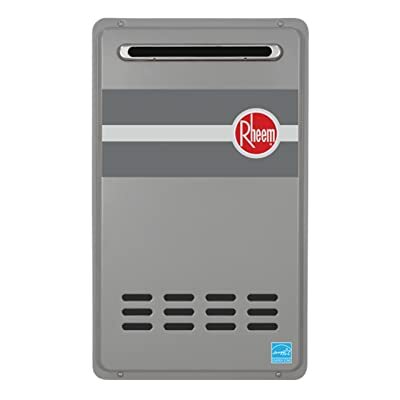 The Rheem RTG-84XL Series is one of the top-selling outdoor tankless gas water heaters on Amazon. With a flow rate of up to 8.4 GPM at a 35-degree temperature rise, it is capable of supplying continuous hot water for up to 2 or 3 bathrooms at the same time. Most customers purchase this unit for homes of 3 to 4 persons. The RTG-84XL is also one of the more easily installed gas models on the market. Everything is well marked for connections and the instruction is straightforward. In addition, this unit is small and lightweight, so you can install it virtually anywhere outside the home. And you can easily control the heater via a digital remote control or an app on your phone. 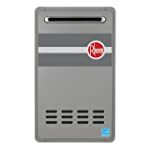 The Rheem RTG-84XL outdoor tankless water heater is available in both natural gas and propane, both versions got a lot of positive reviews from users. This heater heats water on demand with gas but uses electricity for ignition, powering its electronics and preventing the internal components from freezing up. This heater’s outdoor design requires no additional venting and features freeze protection to -30°F. All in all, this is one of the best tankless gas water heaters for mid-sized homes we reviewed. If you’re after an outdoor gas unit that has a reasonable price and is capable of supplying enough hot water to 2-3 bathrooms, the Rheem RTG-84XL is a perfect choice. Whether you’re camping with the family, spending a day at the lake, or lounging around the pool, sometimes all you need is a nice hot shower. Simply attach a garden hose and a 20 lb. propane tank and you are guaranteed to enjoy the luxury of hot water anywhere. You get instant, endless hot water wherever you are. The Eccotemp L10 portable tankless water heater is perfect for campsites, RVs, off-grid cabins, or simply around the house. Wash your car, wash your boat, take a hot shower, or even wash your horse and the L10 will help make daily tasks much easier. You can also add the Eccotemp L10 to a pressure washer for an even better cleaning. This water heater is capable of reaching temperatures between 50 to 140 degrees Fahrenheit, depending on the temperature of the incoming water. It’s equipped with an electronic ignition which is powered by 2 “D” cell batteries making it great for off grid or other areas where electricity is not readily available. The ignition starts the flame only when water is running, so there’s no chance of overheating. The system also works great on modified water systems with items such as a 12 Volt pump. Not only is the Eccotemp L10 one of the best propane tankless water heaters for outdoor use, it’s by far one of the hottest tankless models on the market. If a propane portable water heater is what you’re looking to buy, this Eccotemp water heater is for you. Please note that this unit should not be permanently installed or plumbed into any fixtures: sinks, showers, etc. How to Choose the Best Tankless Gas Water Heater? What Size On-Demand Water Heater Do I Need? Most manufacturers market their gas on-demand heaters with the claim that they’re capable of providing an endless supply of hot water. This is true — but only if the heater is sized to meet peak demand, which is measured in gallons per minute (GPM). For example, a tankless water heater might be just large enough to provide an endless supply of hot water to two showers. But if a third person were to turn on a shower at the same time, demand would exceed capacity and the temperature of the output water would immediately fall. Therefore, correctly sizing a water heater is one of the most important things you have to consider when choosing the best tankless gas water heater for your family. Choosing the proper size is a simple matter of selecting a model based on the amount of hot water that will be needed during peak demand, when a high volume of hot water is used. The peak demand period usually occurs in the morning when most people shower. For example, if one person wants to shower and at the same time another person is using the dishwasher, the water heater must be capable of producing at least 4.0 GPM. A tankless gas water heater that is rated to supply 4 GPM may be the appropriate choice for this household. If two people want to shower while the dishwasher is running, the water heater must produce 6.5 GPM at the desired temperature. The 2.5 GPM figure for showers assumes that the hot water coming from the water heater is reduced to 104°F at the shower’s mixer valve. If you like it hotter, the shower will account for more than 2.5 GPM of output. Then the best tankless gas water heater in this case should not be rated under 7 GPM. The volume of water that a tankless gas water heater can heat is determined by the temperature of the incoming ground water (cold water inlet temperature) – which varies greatly throughout the U.S. and also fluctuates with the changing of the seasons. The temperature of the water as it enters the water heater will determine the amount of “temperature rise” required to achieve the desired hot water outlet temperature. The best way to measure incoming ground water temperature is to use a thermometer to measure cold water temperature during the coldest season of the year. To simplify the process, use this map to determine whether your installation location is in the Southern Zone, Central Zone or Northern Zone. A tankless gas water heater can produce more hot water when it’s located in the Southern Zone than it can when it’s located in the Northern Zone. Increasing the setpoint temperature of the outgoing water also has the same effect on capacity as lowering the temperature of the incoming water. Manufacturers calculate flow rates based on different temperature rise requirements, so when choosing the best tankless gas water heater for your home, make sure you get the proper GPM for your temperature rise need. We’ve collected the GPM capacities at a range of temperature rises for each of our preferred models, but if you opt for a different unit, find this kind of information in spec PDFs on the company website. Condensing vs. Non-Condensing – Which is Better? Condensing tankless water heaters offer efficiency gains of approximately 10 to 15 percentage points over non-condensing tankless units. Most condensing units achieve 92 to 98 percent thermal efficiency and carry the Energy Star label. A condensing unit uses the same sequence of steps to generate hot water as a non-condensing tankless gas water heater. But it also incorporates a secondary heat exchanger to capture and repurpose the heat generated from the combustion gases before they escape and are vented outside. In other words, instead of sending hot exhaust gases out the flue, which wastes energy, condensing heaters use this heat to preheat the incoming water. That’s why condensing tankless gas water heaters are so efficient. Exhaust gases produced by a gas tankless water heater can reach temperatures upwards of 300°F, which is why non-condensing units require venting with non-corrosive metals such as Stainless Steel to protect from condensation. This can become costly as most tankless water heaters do not come with the venting kit. But unlike non-condensing units, the exhaust gases exiting a condensing tankless gas water heater expel at a much lower temperature, usually around 100°F – 170°F, because most of that thermal energy is used to preheat the inlet water through the initial heat exchanger. Therefore, they can be vented with PVC pipe, which is less expensive and quicker to install than the stainless-steel pipe. The price of a condensing tankless water heater can be significantly greater than the price of a non-condensing tankless water heater. But it’s less expensive to vent and burns gas more efficient, it will save you a lot of money in the long run. That’s why most of the best whole-house tankless gas water heaters that we recommended above are condensing.